If there’s one thing I’ve learned by writing about science, it’s this: alternative physics folks love an argument. They particularly love if you make a statement about their model that they think is wrong. Then they can focus on your error rather than defending the merits (or lack thereof) of their model. This is particularly true of some of the more popular fringe models such as the electric universe, planet Nibiru, or the flat Earth. Rather than a single work by a lone genius, these models have dozens of books and websites, hundreds of videos, and a myriad of often contradictory claims. If you aren’t absolutely accurate about every minor detail of their model, if you haven’t read and fully understood everything about their model, then may God have mercy on your lying little soul. Case in point: the great neutrino debate of 2014 – 2018. While I don’t generally focus on alternative science models on this blog, I do like to talk about them from time to time. It’s a great way to show how we test scientific claims based on the evidence at hand. Fringe models aren’t rejected because they seem crazy. They’re rejected because the evidence doesn’t support them. So back in 2013 I started getting comments claiming astrophysics is wrong, and the truth is revealed in a new model called the Electric Universe, or EU for short. Over the next several months these comments got increasingly more common, so I figured I’d start looking into the model. It’s a bit of an odd history. It’s origins can be traced back to The Electric Universe, published in 2007 by physicist Wallace Thornhill and comparative mythologist David Talbot. The broad claim is that traditional astrophysics is wrong, particularly in the way it deals with gravity, or prioritizes gravity in its models. As an alternative it presents a model where gravity plays a minor role. Planets, stars and galaxies are guided and even formed through electromagnetic forces. The universe is electric, not gravitational. Dude, this plasma form looks like ancient artwork! Let’s rewrite physics! The evidence suggests that only a few thousand years ago planets moved close to the earth, producing electrical phenomena of intense beauty and terror. 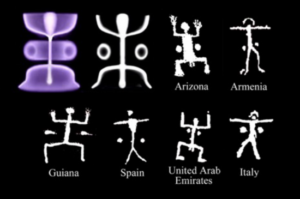 Ancient sky worshippers witnessed these celestial wonders, and far-flung cultures recorded the events in the great myths, symbols, and ritual practices of antiquity. We contend that humans once saw planets suspended as huge spheres in the heavens. Immersed in the charged particles of a dense plasma, celestial bodies “spoke” electrically and plasma discharge produced heaven-spanning formations above the terrestrial witnesses. In the imagination of the ancient myth-makers, the planets were alive: they were the gods, the ruling powers of the sky. That’s some pretty trippy stuff, but it seems to have roots in Immanuel Velikovsky’s 1950 book Worlds in Collision, where he claimed Venus was ejected from Jupiter thousands of years ago, passed by Earth changing its orbit and axial tilt, and the resulting geological catastrophes were recorded by early civilizations, such as Athena (not Venus, but close enough) springing out of the head of Zeus (Jupiter). In other words, the electric universe began as a just-so story. The stories of ancient civilizations must be true, so the authors toss out established science to create a new field of astrophysics. One that can move Heaven and Earth to match their theory. But regardless of its origins, by 2014 the EU model was promoted as a legitimate scientific model. One based not on mythology, but on modern astronomical data. One that mainstream astronomers couldn’t accept because it would overturn their cherished cosmology. Given its history, I could have just mocked the EU model as some kind of Chariots of the Gods kind of nonsense. But I wanted to give the model a fair shake. What are the actual claims of EU, and how do they compare to actual data? Weeding through various websites and videos can be a challenge, but fortunately EU had a great resource for beginners. A Beginner’s View of Our Electric Universe, by Tom Findlay. It was revised in 2013, making it reasonably up to date, and it was highly praised by Thornhill and other leading supporters of EU. As an extra bonus, the author made a PDF version freely available to the public, so anyone can check out the claims of EU for themselves. With this and other resources I was ready to write my post. We will be returning to the idea of nuclear fusion-powered stars later to delve into why this, in fact, is not the way the Sun works and to take a close look at how all stars actually do work, electrically of course. 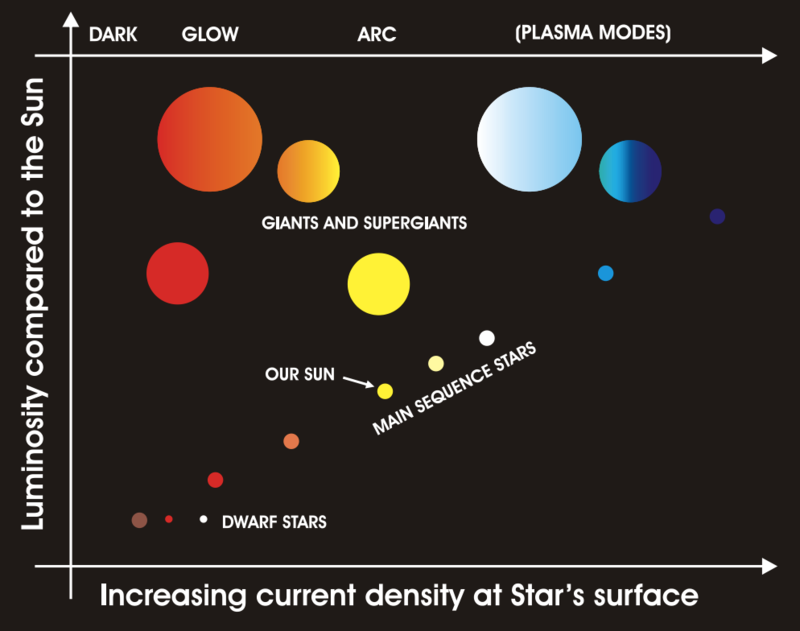 Image from Findlay’s book, showing the relation between current flow and stellar type. In Chapter 6, Findlay explains that stars shine due to cosmic electric currents flowing through a star’s plasmasphere. Rather than nuclear fusion, stars are powered like an arc light. There are two big problems with this idea. One is that without nuclear fusion, the Sun would produce no neutrinos, but solar neutrinos have long been observed. The second is that plasma arc light doesn’t emit light in a continuous thermal spectrum, whereas the observed spectrum of the Sun is a thermal blackbody. Naturally, I pointed this out it my post, Testing the Electric Universe. And thus I sparked the fury of EU fans everywhere. Their biggest complaint was that EU does not say fusion doesn’t occur. Which was evidence not only of my ignoble behavior, but also that scientists in general can’t be trusted. It doesn’t matter than Findlay clearly claims fusion doesn’t occur at all. Since other versions of EU say it might, I’m a lying liar. A couple of folks even tried to get me fired from my university position over this. To this day EU fans continue to demand I explain my unethical behavior, despite the fact that it’s been debated ad nauseam in the comments. Of course the problem is that there isn’t just one EU model at this point, there are several conflicting versions of them. To my best current understanding, some EU models say fusion doesn’t occur at all, some EU supporters claim neutrinos don’t even exist, and some claim fusion occurs near stellar surfaces, but (as far as I know) all claim fusion does not occur in stellar cores. Again, to my understanding, if core fusion were shown to be valid, it would overturn the electric star claims of EU models, and thus most of EU in general. If fusion occurred near a Sun’s surface, it would produce neutrinos, so the mere detection of solar neutrinos is consistent with both surface and core fusion models. However, we can do much more than detect solar neutrinos. We now have measurements of both the types (flavors) of neutrinos and their energy levels. We know the rate at which solar neutrinos are generated at various energy levels. What we find is that the energy of neutrinos follows a thermal distribution consistent with the thermal distribution we expect in the core (that is, produced by intense heat and pressure). Fusion produced by electromagnetic plasmas would have a different spectrum, which isn’t observed in solar neutrinos. We know this because we use particle accelerators (electromagnetic plasmas) to produce neutrinos in the lab. More recently we have finally detected neutrinos from the fundamental proton-proton collisions in the Sun’s core, which is consistent with core fusion. Even if EU’s surface fusion model could be tweaked to mimic core fusion, there were still be the issue of high energy gamma rays. Any fusion of light elements produces not only neutrinos, but high energy photons (gamma rays). We’ve observed the Sun with gamma ray telescopes, and found no steady stream of gamma rays coming from the Sun. We sometimes observe bursts gamma rays coming from very intense solar flares, but this is not consistent with the electric Sun claims. The lack of observed gamma rays is consistent with the core fusion model. Gamma rays are produced in the solar core via fusion, but the photons soon collide with other nuclei in the core, transferring energy to the nuclei to generate heat. Thus the Sun is thermally heated through these gamma rays, which lose most of their energy before escaping the Sun. The spectrum of a plasma arc is not a thermal blackbody. Since the Sun is heated internally through nuclear fusion, its surface emits light with a thermal spectrum distribution. This is known as blackbody radiation. We see this effect in lots of things from heated metal to stars. Objects that have (close to) a blackbody spectrum produce their light through internal heat rather than electron band gaps and such. This is why if you look at light from an incandescent light bulb you will see a smooth rainbow (thermal light), but if you look at a fluorescent light or LED light through a prism you will see specific colors (non-thermal light). If sunlight were produced by surface fusion in the low-density outer layer of the Sun, the light produced wouldn’t be a thermal blackbody. Now, you could argue for some unspecified process that takes the light produced by surface fusion and heats the (more dense) photosphere to produce a thermal spectrum. That would be consistent with the sunlight we observe, because regardless of how the photosphere is thermally heated (core or surface) the spectrum would be pretty much the same. But there’s a problem with a surface-heated photosphere model. If the Sun is surface heated rather than core heated, the surface should be hotter than the interior. Some EU folks actually claim this. But we know from observations that the deeper layers of the photosphere are hotter than the surface layer. So surface heating can’t be right given standard physics. To get around this, some folks such as Pierre-Marie Robitaille now claim that the blackbody law isn’t valid, and that the surface of the Sun is some kind of liquid metal. It gets pretty strange beyond that point. Basically you have to start tossing out well-proven physics left and right just to cobble together a model that can match observation, when the core fusion model already matches observation extremely well and in multiple ways. As I wrote in 2014, the Electric Universe model is contradicted by observational evidence. Neutrinos or no, EU is provably wrong. That fact hasn’t changed over the years, and isn’t likely to. If you’re an EU fan reading this, it’s probably because you tried to argue about my 2014 post, and I sent you this link in reply. Congratulations on making it to the end. It’s been four years since I wrote that post, and I’ve grown tired of constantly being asked to rebut your just-so story. Well it’s clear you still don’t understand what you’re talking about.. The EU model suggests Neutrinos are formed through the process of Fission in the photosphere, not fusion… So your entire argument is vacuous. I wonder why you choose to write fake hit pieces on subjects you clearly have no grasp? So, in the four years since I wrote Testing the Electric Universe there have been (as of this writing) nearly 500 comments. And in all those comments. All the claims from EU supporters that I libeled EU supporters by claiming no fusion rather than surface fusion, not one comment suggests that its photosphere fission. Not one. Y’all had four years to “enlighten” me, but not one single peep. No less than an hour after I again refute the surface fusion claim, here comes a comment that it isn’t fusion, it’s fission. Yay! Calvinball! By the way, your second comment has been deleted. Trying to promote dangerous medical advice in the comments earns you a ban. Brian, I was blocked from your G+ page, so I lost interest. It’s a lot of work trying to keep your blog accurate. You know, I’ve run into people online who just assume that everything you are saying is correct — since you are a professor. It would be nice if you would take more personal responsibility for your own errors. You would have discovered your mistake had you just scanned through the results of a Google search on “electric universe neutrinos”. I think the problem you are running into is that debunking is just not a very good way to learn a subject; when we are going into a complex, controversial subject with an intention to disprove it, we are not actively seeking out the reasons to believe — and so nobody should really be surprised when we fail to believe the end result of our research into how to disprove something. These are half-hearted efforts to understand which are subsequently broadcasted to other people as reasons that they, themselves, then use to avoid learning. The irony is that you are a professor — yet the effect of your instructions on this topic is to encourage people to be lazy thinkers. Whether or not you like it, the Thunderbolts Project is today one of the world’s most thoughtful critics of mainstream astrophysics. A lot could be gained if the astrophysical community was to actually engage their many detailed arguments. What happens, in practice, is a consistently dismissive posture, where they all pretend that cosmic plasmas just cannot behave as laboratory plasmas (as electrical conductors). Let there be no doubt that there is a better way to deal with the controversies of science, which starts with learning the most important arguments on any topic, systematically mapping out the debate — and very importantly, tracking the controversy over time in the light of new, unexpected observations (whether or not they are considered “settled” science). It’s truthfully odd that this is not what the universities are already doing, and maybe that’s the real problem here — that a layperson has to explain this to a university professor. Folks only get blocked on my G+ page if they were A) spamming, or B) repeatedly trolling. I’ll let readers figure out which one you were banned for. Anyone who thinks I’m always right because I’m a professor would be deeply wrong. Just as wrong as folks who think that because they reject mainstream astrophysics they are automatically being objective and open minded. Your claim that the Thunderbolts Project is “one of the world’s most thoughtful critics of mainstream astrophysics” is laughable. The most thoughtful critics of mainstream astrophysicists are mainstream astrophysicists. Pick any topic in astrophysics, and you will find a long history of fierce debate on the subject. Grounded in observations and verified by subsequent experiments. The core fusion stellar model is one of the greatest triumphs of human ingenuity. It began with the question of how stars shine for billions of years. It led not only to the answer, but also how nuclear energy can be harnessed, how the cosmos has evolved over time, and how the very elements are formed. At every step the conclusions were validated experimentally. Apparent contradictions were resolved through careful observation and experiment. A confluence of evidence now supports it. It is a deeply verified scientific theory. But the Thunderbolts folks reject it all. Why? Because some ancient artwork and stories talk about glowing lights in the sky. “That stone painting looks a bit like a plasma, so thousands of years of astronomy must be wrong.” It’s a profound level of ignorance. It’s “Today was cold, so anthropogenic climate change must be wrong.” level of ignorance. But despite it’s origins, several scientists (including myself) have been open to looking at the ideas. But which model? No neutrinos? Surface fusion? Fission? How about the debate over Saturn? Or the EU creationists who think EU supports a 10,000 year old Earth? Or the flat Earth EU folks? Were the canyons of Mars caused by a natural electric discharge, or was it triggered by an ancient Martian civilization? All of these connect to EU. All have websites and videos making their case. There is no EU theory. Thunderbolts is perhaps the most popular, but even it doesn’t stick to a single version. It makes no predictions. But whenever we make an honest criticism of EU, then the trolling, hate mail, ridicule, and violent threats start heading our way. There is the declaration that EU doesn’t have to prove itself right, scientists have to prove it wrong. Prove wrong a model that is contradictory, nebulous, and apocryphal. Prove it to a community that doesn’t understand the basic principles of the scientific method. Until the EU community can take it upon themselves to act like professionals and be accountable to intellectual rigor and scientific evidence, they will never be taken seriously by the scientific community. … unfortunately not when it matters most. The most relevant debate for the topic at hand relates to the former mistaken worldview that space was basically empty. Wal Thornhill has cited this specific mistake on his holoscience site as a root cause for the confusion which today reigns in your domain, but it’s hard to find any substantive mention of this crucial subject — much less its disruptive implications — in today’s science journalism or university textbooks. I did my own personal investigation, and found numerous historical documents supporting Wal’s claim. The problem can be summed up very simply: Most of the theories you and your colleagues are promoting today were initially proposed in a pre-Space Age mindset prior to any in situ space measurements, where it was widely assumed that space is essentially empty (certainly no charged particles zipping around). It is easy enough to show that Eddington plainly admits this assumption in his own logic for the current solar models; the chronology leaves no doubt that Einstein’s work is also implicated in this empty space assumption (since he died before the first in situ space measurements); it can also be shown that when Alfven first suggested that galaxies could have their own magnetic fields, he was ridiculed for the suggestion because of this same empty space assumption. The fact of the matter is that the first in situ space probes were not sent up until around 1958 (Einstein of course died in 55) — because Goddard was ridiculed from 1920 to 1944 for his suggestion that we could send rockets to the Moon (it btw took Nazi’s using Goddard’s designs to attack Europe with the V2 to stop the ridicule). When those first space probes came back down in 1958, scientists were amazed that they returned back radioactive because of the implication that space must not be empty. So, astrophysics and cosmology found themselves in a very peculiar situation by around 1963, once they began admitting in the introductions to astrophysics and cosmology textbooks that plasma is the universe’s most common state for observable matter (the graphic above shows snapshots of around 20 examples of this admission). They basically changed overnight the scientific community’s conception of the universe’s preferred state for matter to plasma (99%+), but then failed to make any substantive changes to the remaining chapters of these textbooks! The problem, of course, was that the momentum of these former hypotheses was by then too great to just suddenly change course, so there would be no substantive revisiting of the theories which can by now be shown to base upon this mistaken pre-Space Age worldview of space that is basically empty. This discovery that space is not empty is actually one of the most important discoveries of the Space Age, but the universities do not convey the history in a manner which clearly points to the implications. It is through this refusal to tell that very important historical discovery that your readers are being misled by your own arguments — because the realization that space is not — in a very fundamental way — what we thought it was necessarily dictates that we must now revisit the original astrophysical and cosmological assumptions and starting-point hypotheses. Tell the history of your domain honestly, and in its entirety, and the notion of an Electric Universe is not as outrageous as you would have everybody believe. And your advocacy merely delays the inevitable, necessary process of re-imagining the universe from a Space Age mindset, without the baggage of that former mistaken assumption. If only I would look at the evidence with a truly open mind. How would I know I’m truly open to ideas? Why, I would accept the Electric Universe! By not accepting the Electric Universe, it is clear I do not have an open mind! Circular reasoning! As you say, how convenient. “the former mistaken worldview that space was basically empty”. I really don’t get it … the current “worldview” is what counts, surely? Your comment here is pretentious and disrespectful. So your pet theory is a bit different from the one criticized here, fine then. How does it measure up to the evidence? Won’t it contradict reality in pretty much the same ways? Such as solar gamma rays, emission spectrum, neutrino flavors and low-energy neutrinos, to take examples from the post above? Making a slight modification to the theory and trying to insult the author are pretty transparent ways to avoid discussion. Extraordinary claims require extraordinary evidence, not lazy rhetorics. My understanding is that fission only produces anti-neutrinos. If so, that knocks that particular nonsense on the head straight away. I’m glad you said that. 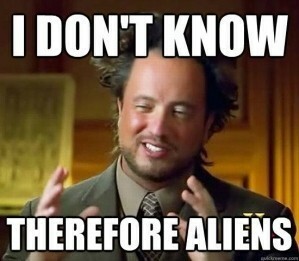 I have been working on a theory that will prove without any doubt that this is exactly it. Brian stands no chance against the Turtle Universe (TU). The Greeks had it right all along! In the EU model, wouldn’t we observe the spectra of the fission products? I really appreciate your effort to read through this EU theory and spend some serious time thinking, debunking and writing about it. I can see how this makes you angry – how the simple argument that our observations don’t match their theory is plainly rejected, and the EU theory constantly tweaked in a desperate attempt to make it match the real world. Long story short: You won’t be able to heal the world from conspiracies. Let’s say that we will wake up tomorrow and all the conspiracies are gone – humans would invent new wild theories in no time. And they would defend them to death. It’s in our nature. Thanks for trying though. It’s nice to in a world of Facebook and Twitter, where it counts more how loud you scream rather than the validity of your argument. Crackpot theories like this are useful in that they help identify credulous fools. They’re kind of like those laughable Nigerian spam emails. Spammers make those deliberately stupid so they weed out people who have any grasp on reality. The ones that remain are easy marks for more personalized scams. FYI, I responded your latest nonsense. I doubt you have the professional integrity to post this link to your blog, but I wanted you to read it. I normally wouldn’t allow Michael Mozina’s comment since it just link-spams to another site, but Mozina isn’t typically allowed to comment on my site any more for reasons I won’t go into here, so it’s understandable that he would make a link-comment in an effort to get me to see it. He wanted me to see the comment, and I’d like readers to see it as well. Not just because it tries to rebut my post, but it does so in a very particular way. If you read my posts, I try to be clear about the difference between attacking an idea and attacking a person. After all, if EU is correct, its ideas should match observations in the long run. I don’t think they do. But Mozina and others think they do. But look at how Mozina deals with criticism of EU. He doesn’t attack the idea, he attacks the person. I’m a liar, unprofessional, unethical, pathetic, and apparently don’t know how to be a man. This ad hominem approach is unfortunately the rule rather than the exception in my experience. Both towards me and others. At this point in this particular sub-discussion, I think its very important to decouple the Mozina topic from any reasoning expoused in EU themed papers. Mozina has chosen to dwell for so long on anything specifically outside the realms of theoretical science, that what we see coming from his mind almost always becomes a classic example of the extremism produced by such undisciplined, unguided excursions. His mind is capable of perceiving a black page as being pure white, and he revels in leaving abundant evidence of this in his ‘web-wake’. He consistenly fails in connecting the dots when it comes to drawing inference based logical conclusions from the statements he makes and what ensues, is always cover-ups and deceptions. Your blog post however, is a terrific demonstration of a willingness by mainstream scientists to pursue the logical consequences of ‘EU theorist’ notions leaving the reader with no misunderstandings about why the scientific process has led us to (the sometimes) ‘uncomfortable’ conclusions confronting us .. and what better platform would there be for launching into research of the not-yet-known? Keep up the good work! .. (It is much appreciated) ..
Just to be clear to everyone, I really don’t want the comments to become a Molina attackfest. Since he’s been blocked from the comments it wouldn’t be fair, since he doesn’t have an equal opportunity to defend himself. Michael, if you’d like to clearly state what you think is the best argument in favor of EU, with no insults, linkspamming, copypasta, or trolling, I’d be willing to let you do so on this post only. If you’re actually interested in what I personally believe is the best evidence to support EU/PC theory, and I only get one shot at it, I’ll refer you to a thread that I started at a neutral website recently where i put together a comprehensive introduction to Kristian Birkeland’s cathode solar model. I should preface my response by pointing out the legitimacy of your criticism that the term “EU/PC” theory means many things to many individuals. This specific solar model is *not* the same externally powered (anode) solar model preferred by Thornhill or Scott. Its an internally powered fusion cathode model which is congruent with Birkeland’s original predictions, and it is congruent with the overwhelmingly positive charge of the cosmic rays that constantly bombard our solar system from all sides. Admittedly it’s a link (which you didn’t want), but you’ll find that this presentation contains no insults and it focuses exclusively upon the merits of the model presented. It’s a reasonably short but comprehensive introduction to Birkeland’s work which provides many appropriate references. I’ll let you decide whether to keep it or not. That’s perfectly fine. Thank you. I hope it helps to prevent at least a few readers from falling into this EU nonsense trap. By the way: one good argument could be, that meanwhile we understand enough of the physics of stars, that it is possible to model them entirely ‘bottom up’ and thus show, that fusion is occuring and also in the quantity needed to explain the observed radiation(s), leaving very little room for other ‘electric’ mechanisms – but I guess EU-fans anyway don’t have the target to explain anything except their weird conspiracy stories. Viewed from the other side, for quite some time I have concerns because of the widening gap between the forefront of science and the common knowledge basis of even well-educated and interested people and its consequences. Therefore I value your efforts (and that of similar bloggers) to bridge this gap and provide an understandable level of recent scientific advancements. This is especially important, because articles in the common media are so often overhyped and blurred, that it is hard to get what really was found and what’s the impact. Thank you for that. I hope both sides will acknowledge that a blog and general discussion is not science, but a forum to discuss respectfully, each other’s views. Two things I’ve noticed are (a) a degree of over-generalisation, particularly conflating one idea with another; if x is nonsense then so must y (b) a lot of judgemental comments that are conveyed with pejorative terms; describing an idea as “nonsense” or “pseudoscience” is not science, and gives science a bad name. An idea is bad when there is evidence to the contrary. I respect both sides for having an opinion, and hope that each side would have sufficient respect for each other, to be able to describe and criticise the scientific merits of each point of view. While the onus is on the Electric Universe to make their case, like any new idea, they must also be given sufficient slack to develop their idea. The “both sides” argument is an attempt at false equivalency. When honest criticism of EU is met with a barrage of personal attacks, then both sides aren’t remotely equal. I did not claim that both sides had any kind of equivalency, or equal merit. Personal attacks are unacceptable. How much slack is sufficient? Good post. To add to the things that electric universe must explain (and can’t) I would like to add the studies of solar and stellar seismology. Although I have not done any work in this area I know people well that have and believe that the work they are doing is well founded and provides real details on the interiors of stars and our sun. I was amazed that this includes a real understanding of the amount of hydrogen that has been burned in the cores of main sequence stars giving a much better idea on the age of a star that has not yet moved off the main sequence. From the initial work on GONG in the early 1980 and before to the more recent use of the Kepler satellite this has provided a wealth of data on the interior of stars. The science is well grounded in seismology and other fields and would be difficult to argue against. Your write: “without nuclear fusion, the Sun would produce no neutrinos, but solar neutrinos have long been observed”. That seem to me to be a death blow of the EU theory. Unless of course, the EU theory suggested that neutrinos could be produce in another way, especially if that way was related to some kind of electrical phenomena. If none can be found, then the theory would be very weak. “the EU theory suggested …” And what is this thing, “the EU theory”? Where is it published? From my limited reading, there are dozens, if not hundreds, of EU “theories”. Or “models”. Or … would the real EU theory please stand up? You had me at, “Thunderbolts [theory] makes no predictions.” If a theory does not advance science and make provable predictions that other theories do not, it is not much use as a theory. Thank you for taking the time to expose this nonsense. On a personal note, thank you for publishing such a great blog. I dabbled at learning the basics of quantum mechanics as a hobby in my retirement, but got a little overwhelmed by the math. I have been reinvigorated, in part by your blog, because of the appeal of quantum mechanics as a foundation for learning about astrophysics. A big leap, I know, but your blog shows the fruits of your self-education, and has me aspire to challenge my intellect further. Go, Brian! No, Thunderbolts has a page they claim are predictions, but aren’t. Predictions have to be precise and refutable, neither of which is true in their case. For example, one of their “confirmed” predictions. Is that there is a slight chance the Deep Impact probe might cause a comet to split apart due to a strong electric arc. That didn’t happen, but they list it as confirmed since (blah blah electric mojo) we knew it would have a weak current. And then they blame NASA for not picking a different comet that would have a strong current. I think that your general description is accurate, but there are several predictions which are sufficiently precise to be testable, and several which evidence has turned out to be consistent. It would be useful to readers to see what you mean by “precise and refutable”. can you provide an example of a prediction for dark matter that is precise and refutable. What test could I do that refutes black holes? I LOVE this comment, mainly because it’s a great example of pseudoscience vs science. John’s first comment was that the Electric Universe folks (in particular Thunderbolts) does make predictions, and that I was wrong to say they don’t. My counter was that they aren’t predictions, and I gave an example specifically from the Thunderbolts website to demonstrate my point. John’s counter was that the example I gave might not be a good prediction, but there are lots of their predictions that are accurate. John doesn’t give a specific example, but the implication is that some broad, nonspecific agreement with observation (however Thunderbolts defines it) is sufficient to support EU. But then John demands that for non-EU models, broad, nonspecific agreement with observation isn’t enough. If there isn’t a specific test that could prove the model wrong, then it isn’t valid. Rules for thee, not for me and all that. This double-standard is common with pseudoscience such as EU. As an example, let me compare a “prediction” and “proof” in EU to a prediction and validation within standard astrophysics. The spacecraft measured the temperatures of Io’s “volcanic” hot spots and gave readings, averaged over a pixel, that were hotter than any lava on Earth – in fact, too hot to be measured by Galileo’s instruments. The argument here is that these hot spots are caused by electric arcs rather than volcanic activity. Thornhill claims that since they are hotter than lava on Earth, it couldn’t possibly be due to volcanic activity. What Thornhill fails to mention is that astronomers have known for decades that Io is more geologically active than Earth due to the tidal forces Jupiter exerts on it. Having lava hotter than Earth’s is perfectly consistent with standard models. So, a result in agreement with standard astronomy is touted as “proof” that EU is valid. In no way does this validate EU, nor is it a test that can distinguish EU from competing models such as standard astronomy. So it is neither precise nor refutable. The black line on the graph is the prediction of cold dark matter. The blue lines are predictions of modified gravity models. The series of red boxes is the observed power spectrum of galaxies. You’ll notice that the data matches dark matter really well. Not “kinda” matches. It matches the prediction down to the little dips and hills on the black curve. The dark matter model makes a precise prediction, and that prediction agrees precisely with observation. Secondly, you’ll notice that the data doesn’t remotely agree with any of the modified gravity models. If the data matched modified gravity, it would strongly disagree with dark matter, proving it wrong. Thus this dark matter prediction is also refutable. Unlike EU, modified gravity models are also refutable, and were, in fact, refuted. This is what we mean by precise and refutable. If you look at the Thunderbolts website, you will never find this kind of precise graph as a test of their model. That’s because EU folks despise using mathematics to give their models precision. They actually argue on their misconceptions page that modern science relies on math instead of “real science.” This allows them to avoid quantifying data in a precise way. Much of the “evidence” for EU is based on broad, irrefutable claims such as example above, or images where they argue “this looks like a z-pinch, so it must be a z-pinch” It’s what I call the quacks like a duck effect of pseudoscience. Scott Dodelson. The Real Problem with Mond. Int. J. Mod. Phys. D, 20, 2749 (2011). Here’s a free version of the article if you’d like to check out the details yourself. Really? What are they? Where have they been published? Which – of hundreds – “EU theory” (or “model” or ..) are they based on? In which papers have the predictions been shown to be derivable from the “theory”? In a rigorous and consistent manner? John: The page of vague expectations you cited is not the real problem. The real problem is the page of “confirmed” predictions based on that page. The author relies on press releases and never looks at the published analysis that makes the page into a liar .For example, a prediction of a flash before impact as well as the flash on impact is “confirmed” by a not cited comment from Peter Schultz describing the impact as having 2 flashes. That is not a flash before impact thus the lie of being confirmed. The published images show a flash on impact and a flash after impact! That “confirmed” lie has been sitting on the thunderbolts web site for over 11 years now. FYI: Two flashes were predicted before the Deep Impact event. The Ames Research Center fired (and still fires AFAIK) projectiles into “comet” analogs. They observed 2 flashes for oblique impacts. Investigation of dust and water ice in comet 9P/Tempel 1 from Spitzer observations of the Deep Impact event. So yet again we have an unsuccessful prediction masquerading as a success! Methinks they need a ‘failed predictions’ page, thereby doing away with the need for ‘pending’ and ‘successful’. Comet breakup: It didn’t. What is this doing on a ‘successful predictions’ page? Advance flash: Didn’t happen. See above. No electrical energy was released before impact. Another failed prediction, confirmed by the Chandra and SWIFT observations. Sheath around impactor: Nope. Thornhill goes on about the failure of the camera, just before impact. This is almost certainly due to dust impacts on an object traveling at 10 km/s. System failure: No. See previous. High-energy explosion: Relies on early press releases. Nothing to indicate that the impact produced anything abnormal, energy wise. Multiple craters: Nope. Relies on their own assessment, which is worthless, and not backed up by evidence. What negative oxygen ions? How will they combine with H+ to form water? At 400 km/s? Total nonsense. And Thornhill has this strange belief that water production rate estimates rely totally on OH production observations. As usual, he is way off base. Mostly, they are now, (and were then) done by IR or sub-mm observation of ro-vibrational states of H2O. These cannot occur in OH. There is no chance of confusing them. Just another indication that he hasn’t a clue what he’s talking about. Fine dust: No idea what he’s on about here. First he says that comets should be ‘electrostatically cleaned’ of dust, and then he says scientists were surprised by how much dust there was! Get the story straight, Wal. Anyway, it is well known that comets are indeed dusty, from both Halley and 67P. This is another fail. Surface geology: Another bunch of misunderstanding. I’m not sure that Thornhill understands the difference between sublimation and melting. Anyways, we can see the ‘boulders’ that fall from cliffs at 67P. Many of them are very bright. Spectroscopically, they are H2O. So, another one in the trash can. Surface arcing: Didn’t happen. Cannot happen. Has never been detected, and would be. Truly bizarre. The white spots on Wild 2 were obviously dust jets. The white patches on Tempel 1 were obviously ice, as seen at 67P. Wrong. It blew out a bunch of solid ice. So, ladies and gentlemen, those were the ‘successful’ predictions re Tempel 1! In summary, there weren’t any. Crater size: TB – We couldn’t see it. Changes to jets: TB: Electrics failed, so we couldn’t tell. Arcs will be hotter: TB: No measurements were made. HE electrical noise: TB: Should be an electrical outburst across all frequencies, including X-rays. They say there were no instruments capable of detecting such a thing. Truth: Didn’t happen. Chandra and SWIFT both looked at the comet before, during and after the impact. No X-rays were seen until after the impact, and they are soft and perfectly in line with charge exchange reactions between the liberated vapour and the solar wind. Copious X-rays: TB: Due to discharges to the projectile. Same excuse as above. Truth: See the Chandra and SWIFT papers above. Truth: I have seen nothing to suggest that the impact ejecta behaved in any way abnormally. Given that there was no electrical woo, as above, then this is an irrelevance anyway. 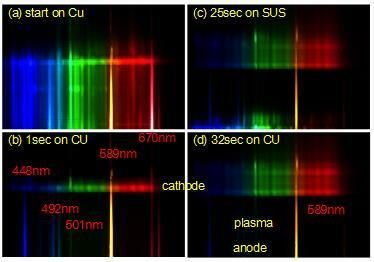 Ionized copper: TB: Should be detected. Same excuse as above. Truth: Not aware of any detection of copper ions. Impactor was made of copper. Heavy elements: TB: Due to the non-existent discharge from the nucleus to the impactor. Negative ions: TB: Should be an abundance due to comet being negatively charged in the electric comet fantasy. The above should give a good indication of the scientific credentials of the person behind much of the EU ‘science’. Jacobus Kapteyn first mentioned “dark matter” in 1922. If it took 89 years before a paper appeared with detailed predications, then there is still plenty of time for the EU to come up with their own detailed predictions. The problem with the droll “quacks like a duck” quip, is when the subject turns out to be a goose. If we switch from the Electric Universe to the Plasma Universe, then their proponents also recognise cosmic pinches; except that they don’t base their observations on morphology alone, but include particle-in-cell simulations, characteristic synchrotron radiation based on laboratory experiments, and a range of properties in the radio, optical, x-ray and gamma spectra. So when the EU people say “it looks like a z-pinch”, what they mean is that it has one characteristic that is consistent with a z-pinch, and other characteristics will help determine it. Notice, dear readers, the troll in its natural habitat. Whenever the troll is confronted with evidence, it crawls deeper into the shadow under the bridge, hoping to lure another goat. Response: They aren’t predictions, for these reasons. John: Nuh Uh, and what about your theory. Dark matter can’t be proven wrong! Response: You’re changing the subject, but here’s a clear documented example of how it could. John: … An alternative to EU makes different claims! Stop mocking me! Response: Okay, now I’m mocking you a bit, but that’s because you’re just trolling. And this is why there are many people who are attracted to the EU theory. Not because it is a strong alternative (it isn’t), but because you call people trolls (I’ve responded to you with respect), and I haven’t mocked you. You are correct that I have not provide concrete scientific rebuttals to your comments, and I recognise all the weakness that you are pointing out. Yet the EU people, and their supporters, are also not convinced by your argument, which is not to say that you are wrong. My comment was indeed snarky, so I apologize for that. However, your comments follow exactly that of an online troll. You posted a blanket claim supporting EU. When that was rebutted with specifics, you brushed it aside and made the same claim again. But rather than sticking to that topic you moved on to another topic, demanding I defend mainstream physics. After I did that you again brushed it aside and moved to a third topic, this time plasma cosmology. You aren’t talking about the topic at hand (EU and its pseudoscience approach) and are instead making comments peppered with undefended claims while trying to move the conversation off topic. Trolls also strive to draw out reactionary or emotional responses (which you succeeded in doing), and then point to emotional responses as if they disprove the OP’s position. This is classic trolling, and calling you out on it is not mocking you. The way in which I called you out was. My apologies for sounding trollish, and drawing out an emotion response, it was not my intent. I’m not sure what you think was rebutted. You did show a detailed example of what you believe constitutes a detailed prediction. I don’t believe that rules out the EU predictions, only that they are less detailed. I am fine if you think that means they are of no value, I think that a prediction which, for example, predicts that the “Shape of Sun’s galactic plasma environment” would be “an hour glass” shape, is sufficiently novel and testable (and I accept that you won’t). “Jacobus Kapteyn first mentioned “dark matter” in 1922” Do you have a citation (reference) for this? AFAIK, it was Zwicky who first published a paper using the term “Dark Matter”, and that was in 1933 or 1934. “it took 89 years before a paper appeared with detailed predications” Huh? There are thousands of papers with “detailed predications”, and many hundred date in the 1970s alone. “If we switch from the Electric Universe to the Plasma Universe” Why? Isn’t the whole point of this discussion to consider the EU? “include particle-in-cell simulations, characteristic synchrotron radiation based on laboratory experiments, and a range of properties in the radio, optical, x-ray and gamma spectra” True. Sad, then, that none of these “Plasma Universe” papers report much in the way of consistency with relevant astronomical observations, especially those of the last decade or so. As Brian correctly pointed out in the initial blog, the ‘Electric Sun’ nonsense is ruled out on any number of points. It doesn’t deserve the time that some professional scientists have spent debunking it. It is laughably poor ‘science’. If fusion is occurring on he solar ‘surface’ (i.e. the photosphere), why can’t we see it? That is, as Brian points out, where is all the gamma radiation? Secondly, we know very precisely how much p-p fusion is occurring due to the neutrino count. Now, if that amount of fusion were occurring in the photosphere (it isn’t), what would the gamma ray flux be? Having worked that out, what do you think the implications of that flux would be for astronauts, satellites and the general welfare of life on this planet? Assuming it ever got started. I realise that maths isn’t a strong point with EUists, but do give it a go. I look forward to the results. OK, so let’s make it two points; something else they may want to try, is figuring out where this invisible current that is supposed to be powering the Sun is coming from, and why we can’t detect it. Let’s be generous, and pretend that it may exist. Does it carry a magnetic field? Well, it’s a current, so one assumes so. So, what do we think will happen to this current (presumably electrons) and its associated magnetic field, when it meets the outflowing solar wind electrons and ions, and their associated magnetic field (the IMF)? I assume that one or more of the electrical geniuses has taken the time to model this, at least in a back of the envelope kind of way. So, what is the outcome, and what should we observe? And why don’t we observe it? Your reasoning is correct, the lack of gamma rays suggests that there is little or no fusion at all, occurring on the surface (or within) the Sun. Sorry John, but that is where you are wrong. Yes, it does rule it out on the surface. However, the very existence of the required amount of neutrinos proves that it is happening in the core. Why do you think Thornhill et al came up with this surface fusion nonsense? Because they knew that neutrinos can only be due to fusion. They don’t want a nuclear powered Sun, but they needed to explain the neutrinos – so they rather stupidly suggested that the fusion was happening at the surface due to some sort of electric woo. Neutrino can also be produced in particle accelerators, which also use some kind of electric woo. Actually John, I have (for the first time ever) just sat through an entire electric universe video, featuring Wal Thornhill. This would explain why there is blood pouring from my eyes and ears! The video in question was supposedly from 2014. Thornhill, however, is discussing a press release from SNO from 2001, and is obviously reading from a script of an article he wrote on his holoscience blog back in 2001, which I had just read. The closest we get to any explanation for the neutrinos is that there is ‘heavy element nucleosynthesis where we can see it, i.e. the photosphere.’ That’s pretty much word for word. 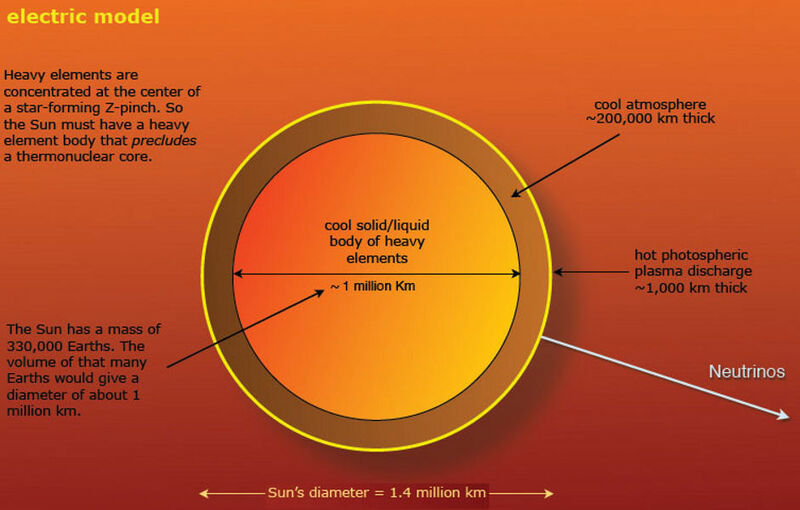 Thornhill believes that nuclear fusion cannot explain the amount of heavy elements in the Sun. Heavier than helium, that is. He’s wrong, of course, as he always is. The heavier elements were produced by other stars at the end of their lives, and were then seeded into the interstellar medium via supernovae. He doesn’t buy this, as he doesn’t think there would be enough. Given that he thinks supernovae are z-pinches, it’s hard to know what he thinks, actually. It usually involves z-pinches, Birkeland currents or double layers. Now, I’m no expert, but others may help here – if the neutrinos weren’t from p-p fusion, or those involving He and Be, and were coming from ‘heavy element’ fusion, then wouldn’t they have a very different energy spectrum to that which is observed and, indeed, predicted? Please don’t tell me that he hasn’t considered this! (rhetorical). I know. It was ludicrous. However, what I was asking is what did he (or Scott, or Thornhill) think was going to happen when this current and associated magnetic field, encountered the solar wind and its magnetic field? Don’t tell me that they haven’t thought of this! I’m not intending to make you the official spokesperson for the EU crowd! I have spent a few years looking at this EU stuff, and am indebted to various well qualified people who have debunked it previously. My question was a bit cheeky, and basically rhetorical – I know damned well that they haven’t considered such a thing. If they have, then they haven’t put it down in writing anywhere that I. or others, could analyse it. This does not surprise me. In my opinion Jurgens and Scott should have stuck to electrical engineering, as they are/ were way out of their depth when it comes to astrophysics. Thornhill is just way out of his depth, full stop, and should have remained at university long enough to get a PhD, instead of dropping out to study Velikovskian lunacy. I’m afraid that anyone who takes that stuff seriously has, by definition, a serious lack of scientific understanding. I really do not understand why anybody would take these people seriously. What I find amazing about this is that so many EU fans accept it without question. What’s particularly remarkable about Pierre-Marie Robitaille’s is that they directly predict that a certain kind of perpetual motion of free energy device is not only possible but easy to build. Yet no EU fan seems to have grasped this; certainly none of them have built such a device, based on his “theory”. Why is this? I don´t think this is an argument. This is something else. Things that Brian picked out to test EU model, were seemingly random but crucial according to their own claims. EU model didn´t stand the test, but more importantly I don´t think they even know why he picked up those points – what is he talking about. I think the conspiracy folks just counter what critics say, they have no real understanding in theory of relativity, QED, particle physics – thinks that they try to overthrow. To even think what science/physics we know today have required during centuries – astronomical amount of hours in work and experiments, brilliant minds from all over the world, mindboggling accomplishments like Manhattan project, moon landings, LHC to counter what – some random name and word dropping, youtube videos? This is absurd. Actually, I have already calculated (oh the horror, math!) why Juergens’ model cannot be correct, and that holds for all electric sun models, and that is that the interplanetary magnetic field would be (several) orders of magnitude larger than measured by spacecraft if currents are inflowing into the sun. It is somewhere on internationalskeptics, and got mocked on thunderbolts. Brian – Been a while. I quit writing to you about EU a few years ago because it as fruitless because of our very strong differences. However, something new that the EU’s come up with has inspired me to take another shot at you and your gravity cosmology crowd. It’s called SAFIRE. It’s a laboratory experiment to create a star in a very large vacuum jar! Without any huge government spending to support their efforts (such as you and your crowd enjoy to our immense disadvantage) they have been very successful with this privately funded project which, in this 1+ hour video, “shows you their science”as they journey through some of the most profound plasma phenomena ever seen before! IMHO, it is taking them very close to reaching their objective. This is not a troll post. It is meant to update you folks on the EU’s progress in their unrelenting quest to prove their contentions and correct their beginners’ errors of the past. A lot of your folks are now coming on board of this adventure to seek the truth of the sun as a result of this kind of scalable laboratory evidence that the sun most likely is an electric plasmoid. Manga! Yeah, our strong differences are mainly the fact that I focus on evidence rather than wild speculative claims. The SAFIRE project hasn’t made progress, just more of the same pseudoscience. Quack! Quack! Brian – Your “Quacks like a Duck” article was written in 2014 on now much out-of-date information about the EU’s SAFIRE project. Did you take the time to actually watch the 2018 video with all of the new information on that project to which I linked you? Probably not. This is to be expected from good old arrogant you and it is somewhat reminiscent to me of the scene in the original Rocky movie wherein Apollo Creed’s manager tries to get him to begin to take seriously his upcoming fight with his underdog opponent Rocky Balboa, but Apollo just dismisses him out of hand as being a mere local “ham and egg” fighter who’s only claim to fame will be to oppose the champion (him) so as to make a few bucks before he quickly goes down in flames to Apollo’s superior boxing skills! This small, humble, privately funded, basic solar plasma research project, called SAFIRE, I see an underdog Rocky to your condescending, supposedly superior, hugely government funded, standard model Apollo! Today’s SAFIRE project’s results are already suggesting just exactly why 50+ years of extremely expensive, worldwide government funded fusion research by your standard model scientists has been unable to and will continue to be unable to accomplish its goal of creating a stable, sustainable fusion plasma reactor (a star in a bottle). This video is not about “wild” speculations as you call them, Brian, but it is all about cold, hard, scientifically garnered and documented facts that have been culled from this basic research experiment which has been able to electrically create a sustained, precisely measurable, electromagnetic plasma in their vacuum bottle that can now be duplicated by other plasma scientists worldwide! I believe that you and your crowd here need to watch it with an open mind so that you can see for yourself the EU’s progress as it has unfolded, before the EU moves to get into the ring with you and show you all a thing or two about plasma which will humble you, just as the humble Rocky did in the fight with his arrogant opponent, Apollo Creed! That’s when the EU (like Rocky) can take home some of the prize money (of your government funding!) for their very realistic plasma research which is unlike your standard model scientists “wildly” speculative and always unsuccessful plasma fusion research. I’ve not watched the video, but I’ve read a few of the PDFs from their site. What am I supposed to be seeing? They hook up a metal sphere to the mains. In what way does that resemble a dirty great ball of gas? All the things they see are due to the current from the mains. Where is the solar system equivalent? No current, ergo no relevance. And the Sun is not a highly conducting metal ball. We see sufficient neutrinos, at the requisite energy spectra, to know that the Sun is powered by fusion. This is a done deal. You will find nothing in the scientific literature claiming otherwise. Scott’s/ Juergen’s model is a joke, where they claim the neutrinos are produced by a z-pinch in a double layer in the chromosphere (wouldn’t be EU woo without reference to z-pinches and DLs! All we need now are Birkeland currents, for the trifecta!). This is idiocy squared. One of the by-products of fusion is gamma rays. Where are they? Why aren’t we all dead? So, I would humbly suggest that the experiment is a waste of time and money. First, you need a viable scientific model. You don’t have one. Then you need some evidence that said model might be correct (i.e. an incoming current). You don’t have any. So as it stands, I’m afraid it is a complete irrelevance to heliophysics. It may interest a niche market of people who are interested in what happens when you stick a squillion volts through a metal ball, but I don’t really see A & A, ApJ, MNRAS et al being interested. Maybe Kronos? Are they still going? nuclear bombs! That’s what you’ll be seeing in this video about this project which humbly attempts to scientifically prove (or disprove) some of the contentions of the EU. But you’re so imperious that you’re above watching it because your arrogance stupefies you into believing that the sun can only be powered by fusion. 2 Thessalonians 2:10-12 because they do not receive the love of the truth….for this reason God will send upon them a deluding influence so that they will believe that which is false, in order that they may eventually be judged as being foolish, who do not believe the truth, but take pleasure in the wickedness (of arrogance). The new SCIENTIFIC FACTS which are now being created and measured IN THE LABORATORY of this project (which you pompously label “idiocy squared” and “a waste of time and money”) are a shot across the bow of your bastioned “settled science”, your “done deal” of a so-called fusion-powered sun. And as far as evidence of an “incoming current” in space for the EU’s model is concerned, putting just a little bit of the time and billions of government dollars which are now being wasted by you standard model folks in chasing down nonexistent dark matter, dark energy and black holes, into doing a focused search in dark mode space for its current, is sure to find it! IMHO, sir (or ma’am), you give new definition to “closed mindedness” in the hubris of criticizing a video (which supercedes all of the EU’s pdf’s) that you’ve not even watched! Sorry, you’ve just gone off on a rant, and answered nothing. Neutrino data falsifies all electric sun models. Done deal. Forget it. They are not impressing anybody by electrifying a metal ball. And you’ll never see it published in a decent journal, if at all. And what the hell is ‘dark mode space’? A current is a current. Electrons (or ions) flowing TOWARD the Sun. Battling past the solar wind. And the magnetic field carried by the solar wind. There is absolutely zero evidence for this, nor even a viable scientific mechanism, as far as I can see. Every time we put plasma instruments on a spacecraft, and fly them, they are collecting data that shows that this incoming current doesn’t exist. Therefore, I reiterate; you are wasting time and money, chasing something that is nothing more than the musings of people who simply don’t understand the astrophysical environment. Did you ever hear the one about Scott using an electric field to explain solar wind acceleration?!!! This is the level of ignorance we are dealing with here. Apollo anw16 Creed – So here’s a video that you probably will not view before you ostracize it of the EU’s argument against the standard model’s presumption that neutrino counts support their theory and discredit EU theory…. As far as dark mode space, I meant to say dark mode electric currents in so-called empty space. So here’s an in-depth article on that subject which according to your imperious M. O. you also probably will not read before ostracizing it. Now, unless someone with an open mind who actually takes the time to view my linked EU videos and read my linked article on electricity modes responds, there is absolutely no point in me continuing to reply to these kinds of close minded rebuttals. I’ll just sit back and watch the standard model disintegrate over time as its anomalies are proven to be better explained in our God-given Electric Universe model! Oh by the way, God’s throne is the source from which He dispenses all of the electric power that He has invested but is still hidden from unbelievers in His EU! Habakkuk 3:4 His radiance is like a bright light, great lightnings stream down from His hand, and there His power is hidden! Mark 14:62 ….you shall see the Son of Man sitting at the right hand of Power, and coming with the clouds of heaven! Errr, yes, I’ve seen that rubbish from Thornhill before. First off, he says the neutrinos are from ‘heavy’ element nucleosynthesis. This is trivially false, as the paper Brian linked to way upthread explains. Neutrinos from different parts of the p-p chain have different energies. If Thornhill was right (and he never is), then the energy spectrum we see should be dominated by neutrinos from ‘heavy’ element synthesis. It isn’t: https://www.nature.com/articles/nature13702 & http://iopscience.iop.org/article/10.1088/1742-6596/675/1/012027/pdf (among others). So, his suggestion (it isn’t even close to a hypothesis) is already falsified. He also has this fusion occurring on the surface, and Don Scott has it in the chromosphere. The very fact that I am alive to write this, and you to read it, proves that to be false. Care to guess why? Gamma rays! Nasty things. If all the fusion needed to account for the neutrino flux were occurring on or above the photosphere, it is unlikely that life would ever have evolved on this planet, except perhaps in the oceans. He also makes an idiotic claim that flavour changing cannot be confirmed unless we put a probe to detect them very close to the Sun! We already see neutrino flavour changing on Earth; see https://arxiv.org/pdf/1605.06169.pdf and references therein. So, taking into account the facts that the standard model does a very good job of explaining the behaviour of our star, and has plenty of evidence to back it up, I see no reason to ditch it for a much inferior ‘model’ that has zero evidence, and scientifically unfeasible mechanisms to explain that behaviour. “your” inked article on electricity modes? It seems that the author is “iantesman”, not Jim Hanson. I read the article, and am wondering if “dark discharge” regimes emit photons other than in the part of the electromagnetic spectrum our eyes can see? It seems to me that they must, if for no other reason than that electrons (and/or ions) are accelerating, and accelerating charges emit electromagnetic radiation. Right? About SAFIRE: for the Sun, where is the equivalent of the wire which connects the metal ball to an external EMF? Is there any part of EU that you might be able to accept? Maybe we need to find a middle ground and see if we can work out from there. There are claims in EU that standard cosmology also makes, but it isn’t really common ground. Both Flat Earthers and scientists agree that on a small local scale the surface of the Earth can be treated as flat. That doesn’t make the flat earth model in any way valid, because their basic principle is contradictory to observation. The same is true with EU. They claim relativity is wrong, NASA lies, etc. There isn’t anything to work with there. From isciencefoundation.org/safire/ – Measurements of plasma activity in the SAFIRE chamber will be correlated with recent NASA data on the Sun. From the observations gained, the SAFIRE team hopes to determine the extent to which the Sun is responding to a “heliospheric electric field”. Of course, that field could be immeasurable at planetary distances from the Sun. However, across the massive volume of the heliosphere it could hold sufficient charge to account for solar behavior that might otherwise remain unexplained. If so, the SAFIRE findings could open a new chapter in today’s solar physics. Errrr, Jim, no it won’t. For reasons already explained. No incoming current. You cannot explain the neutrino count, nor the energy spectrum. You cannot have fusion on or above the surface. Among other fatal flaws. It is a non-idea. Nobody, other than a handful of EU zealots, will pay the ‘experiment’ any attention whatsoever. The model(s) already fail theoretically and observationally. Given that there is absolutely nothing in the scientific literature on this nonsense, then one can say that it doesn’t even exist, scientifically speaking. Apollo ianw16 – I believe that you and Brian and most all of your standard model plasma physics crowd will soon be eating a lotta crow because of the imminent monumental impact of this brilliant, groundbreaking plasma experiment! Too bad for the both of you but that’s the sure fate of those who do not love the truth of a matter and move to adopt it. So I repeat…. 2 Thessalonians 2:10-12 because they do not receive the love of the truth….for this reason God will send upon them a deluding influence so that they will believe that which is false, in order that they may eventually be judged as having been foolish, those who did not believe the truth, but take so much pleasure in the wickedness of their condescending arrogance. “And with all deceivableness of unrighteousness in them that perish; because they received not the love of the truth, that they might be saved. And for this cause God shall send them strong delusion, that they should believe a lie: That they all might be damned who believed not the truth, but had pleasure in unrighteousness. Fun fact: these verses are often cited by folks arguing that they are the “elect” and are saved by God’s choice from birth. Note that the passage talks about how God will deceive those who are condemned. God willing deludes people to ensure that they will be damned. Jim just claimed that God is filling our head with lies, and will cast us into the fire because we didn’t believe in the SAFIRE project. Making threats against people, divine or otherwise, earns you a permanent ban, Jim. Bye, and God Bless. Ahhh, I thought Thessalonians was a Greek football club. You live and learn. There are absolutely merits to so called Electric Universe Theory. How rude of hou to dismiss it entirely! As if the multi verse isn’t domindated by electrical and magnetic forces. As if the electric force isn’t superior to gravity. You can have existence without gravity. Can you have existence without electricity?? The corona being oh about a million degrees hotter then the surface of the sun is all the proof you need the sun is discharging in an electrical nature. You call electricity and magnatism a psuedo science! As if they are not fundamental forces of everything, our star especially! This is why so many people hate the smug and entitled high priests that are blaspemous to question. Nasa basically describes the sun in electrical terms. It is plasma ya know? and what is the defining characteristic of plasma?? Wow awesome, your post is awesome! But not in a good sense, sadly. I’ll comment on just one awesome piece of bad logic: “The sun is plasma, correct? The definng nature of plasma is it’s electrical properties, correct? Therefore the sun is electrical CHECKMATE”. How about this: “The Sun is yellow, correct? The defining nature of yellow is its electromagnetic properties, correct? Therefore the sun is electromagnetic CHECKMATE”. Or this: “The Sun is hot, correct? The defining nature of hot is its thermodynamic properties, correct? Therefore the sun is thermodynamic CHECKMATE”.